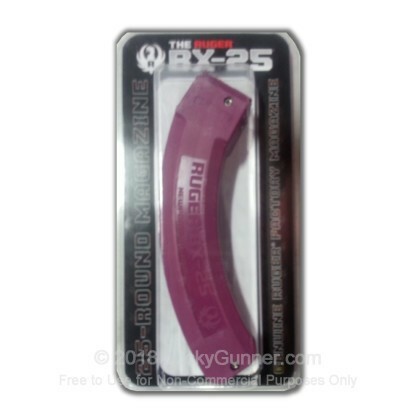 If you are looking for high-capacity fun with your Ruger 10/22, SR-22 and 77/22 Rifles or 22 Charger™ Pistol, then check out the BX-25 High Capacity Factory Magazine from Ruger. This 25 round magazine is easy loading, easy to clean and made in the USA. Ruger factory magazines are designed to function flawlessly in your Ruger 10/22. This high capacity magazine holds 25 rounds and features metal lips for improved feeding and reliability. The BX-25 is the only high capacity 10/22 magazine on the market which disassembles for easy cleaning.